Helps you determine the encoding of a file by displaying the beginning of it in hex and decoded characters in any of the supported Java encodings. If the file is made only of printable ASCII (American Standard Code for Information Interchange) characters, then almost any encoding can be used to read it. If the display shows blanks between each character then chances are you have some variant of UTF-16 encoding. The BOMs (Byte Order Marks) can also be a clue to the encoding. Also try the national encodings of the country where the document came from. For HTML (Hypertext Markup Language) documents you browse of the web, look at the declared encoding in the http-equiv=Content-Type header using Wireshark. It is often correct. A good bet is North American Windows files will be ISO (International Standards Organisation) 8859-1, Linux files UTF-8 and emails SO (Significant Other) 8859-1. There is no mechanism to keep track of which encodingwas used to write a text file. You just have to know. The Encoding Recogniserwill help you guess. Originally this caused no problem because people rarely exchanged files except with coworkers. Everyone’s files were encoded in the same local national encoding. Today people share files all over the globe. It is best to use ASCII for 7-bit chars, ISO-8859-1 for 8-bit and UTF-8 for 16-bit. for the current version of Encoding Recogniser. Helps determine a fileÃ¯Â¿Â½s encoding by displaying it presuming all the different supported encodings. 563K zip for Encoding Recogniser Java source, compiled class files, jar and documentation to run on your own machine either as an application or an Applet. access encodingrecogniser source in repository with [Tortoise] Subversion client on wush.net/svn/mindprod/com/mindprod/encodingrecogniser/. 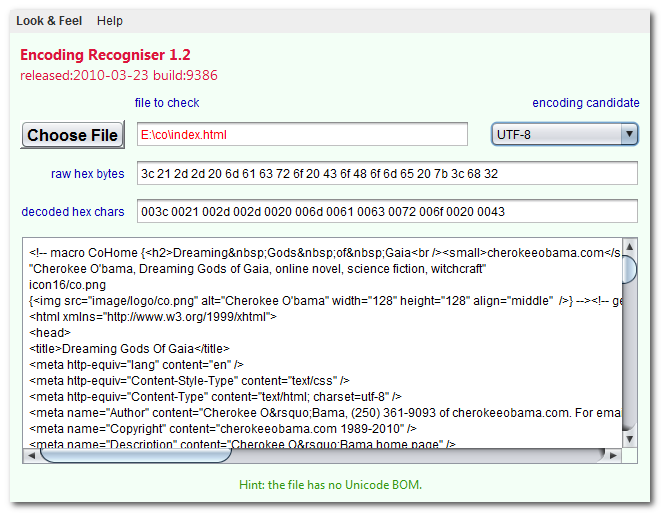 download ASP PAD XML program description for the current version of Encoding Recogniser. Encoding Recogniser is free. Full source included. You may even include the source code, modified or unmodified in free/commercial open source/proprietary programs that you write and distribute. Non-military use only.